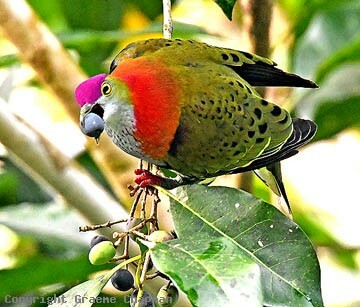 The Superb Fruit-dove is mainly found in coastal rainforests of eastern Australia from Cape York south to north-eastern NSW.There are odd records as far south as Sydney and vagrants occasionally reach Victoria. Outside Australia they are widespread from Sulawesi through to New Guinea and the Solomons. Superb-fruit-doves were once known as Purple-crowned Pigeons - the males are amongst the most beautiful of all the fruit-doves. Not easy to observe or photograph much of their time is spent up in the foliage of high rainforest trees. 023203-D ... 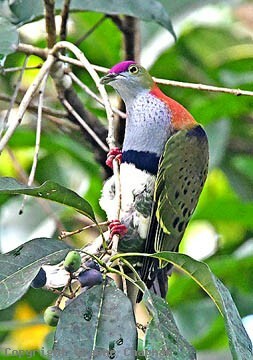 Superb Fruit-doves are very agile and crawl through the foliage at all sorts of angles to reach hheir food. 023204-D ... 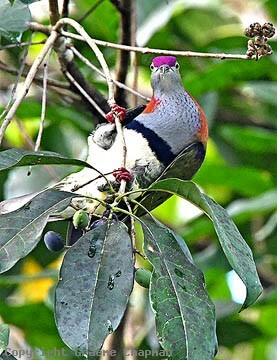 Superb Fruit-dove, adult male. 023207-D ... 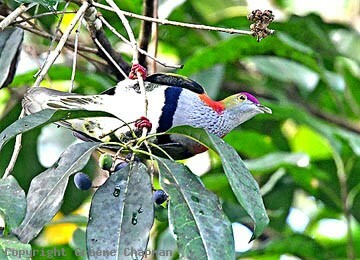 Superb Fruit-doves eat all their fruit whole - this was a struggle!